Short on time? Follow this link to a Google Maps version of our guide for what to in Healdsburg with all of our favorite spots labeled! You can “follow” the guide, and the saved locations will automatically transfer to your own Google Maps account. Tyler and I have lived in the South Bay Area in California for almost four years now. We are very blessed with great jobs that have kept us in the Silicon Valley (at least for the time being). While we’re very thankful for the opportunities we have here, we’ve always found the area outrageously expensive, completely overrun with techies, and depressingly sterile. Part of the reason starting a travel blog was such an easy transition for us was because we spent most of our weekends already just trying to get away from this valley. Fortunately, what the Silicon Valley lacks in character and charm, it makes up for with its proximity to some of the most beautiful areas in California. We recently had the opportunity to take a weekend trip to Healdsburg, a town about 100 miles north of where we live, in the heart of Northern California’s wine country. This was our first time in Healdsburg and we fell in LOVE. Tyler and I love wine tasting, but the Napa and Sonoma areas nearby are really expensive and touristy, so we hadn’t spent a ton of time up there. Healdsburg, however, is Napa’s charming and down-to-earth counterpart. The town sits in the northern part of the Russian River valley and is full of world-class wineries and amazing restaurants and shops. The businesses in Healdsburg are all locally or family owned, and everyone we met was SO nice. In fact, we even commented that we found the locals in Healdsburg nicer than any other place we’ve visited in California. We actually had planned this trip for earlier last fall but ended up canceling it when the fires tragically tore through Northern California. Fortunately, Healdsburg was spared any major damage, but a lot of the surrounding area was affected. We spoke with a handful of local business owners about the effects of the fire on business, and they said that even to this day people will call and ask, “Is there still wine? Is anything open up there?” A lot of this, of course, is due to the media coverage of the fires, featuring images of wineries going up in flames every second. The area, though in recovery still, is very much alive and kicking, and it’s important to continue to support these businesses. Another way to help the long term recovery is by donating to the Sonoma County Resilience Fund here. We had a fabulous time walking around the adorable town, exploring the wineries in the surrounding area, and getting know the local business owners that we were lucky enough to meet. This was the PERFECT weekend getaway, and we’d recommend Healdsburg to anyone needing some fresh air and an escape from the hustle and bustle of the Bay Area (and, of course, a flawless pinot noir). A group of friends joined us on our weekend vacay to Healdsburg, and we all stayed in a stunning suite at the Two Thirty-Five. This was by far our favorite part of the trip. The Two Thirty-Five Suites are right around the corner from the main square of downtown Healdsburg, an ideal location for walking to and from all of the tasting rooms and restaurants. These luxury suites are perfect for group travel because they are big enough to give everyone their own space and privacy but also have spacious and cozy common areas for everyone to comfortably hang out together. For example, our group definitely took advantage of the full kitchen and living room. We cooked breakfast one morning, had a movie night the first night, and had a very rambunctious game night the second night. We loved it because we could enjoy the down time between activities together and didn’t have to schedule every minute of the weekend. The manager, Holly, and her staff made us feel right at home and even took the time to help us get acclimated to the area and had some amazing suggestions of where to eat and wine taste. The Two Thirty-Five is really embedded in the local business scene. Once a month, they team up with a local restaurant, Café Lucia (more on this gem below), and a local winery to put on a happy hour. This is just one example of how the businesses in Healdsburg all support each other, and it was the perfect way to kick off our weekend. We kicked off a day of wine tasting at Gary Farrell. We took a tour of the property, and our guide showed us all of the ins and outs of the winemaking process. Tyler, who majored in industrial engineering, was just THRILLED. At the end of the tour, we did a tasting in the most picturesque room ever with views overlooking the entire valley. We definitely recommend a stop here. We loved the pinot noir! Next on our tour was a stop at Portalupi, near the square in downtown. This was a fun break from all of the California wines we’d been tasting all day, and the owner, Tim, took us through a tasting flight of amazing Italian-style wines. We loved hearing the story behind the winery and how the family started it to honor their Italian heritage. We bought a bottle of the vermentino (which we hadn’t heard of before this!) and know it will be perfect for a warm summer evening. 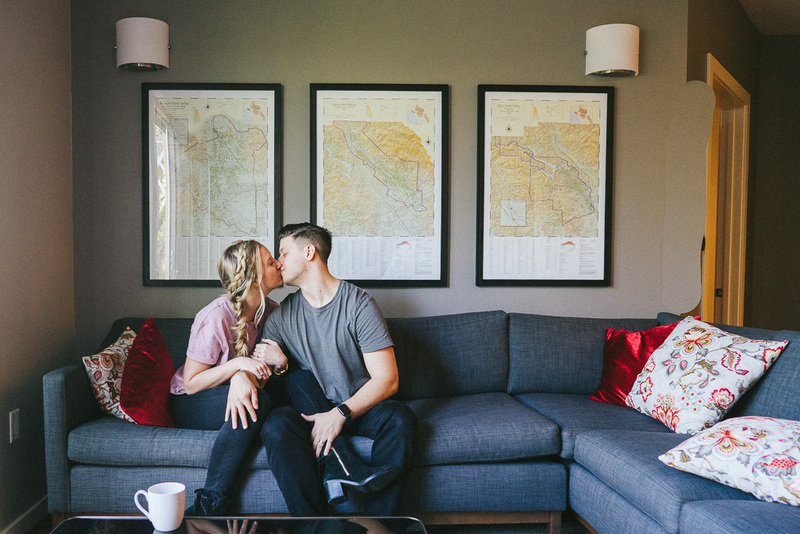 The romantic in me just swooned over the love story that started Cartograph Wines. This is a must-stop on any tour of downtown Healdsburg. We chatted it up with the team at Cartograph for a couple of hours and absolutely loved the gewürztraminer. We thought it was so fun that they made a gewürztraminer, an Alsatian wine, which we had only tried once before in Strasbourg a couple of years ago. As fate would have it, the happy hour at the Two Thirty-Five featured Hawley Wine. We loved the wine so much that we stopped by their tasting room in town on Sunday and definitely recommend it. We sadly didn’t have enough time to make it Breathless this trip, but it is definitely at the very top of our list for next time. We wanted to mention it on our guide because SO many people we met told us to go there to try their sparkling wines. Again, family owned, started by three sisters, how cute is that? On our first night, we got a reservation at Campo Fina. One of my favorite meals is a big salad with an even bigger pizza to go with it, and that’s exactly what I got at Campo Fina. They have a really unique, Italian-inspired menu that made me want to go back again to try something different. Great staff, great vibes. Café Lucia was one of our most unique dining experiences to-date. It also sits literally right below the Two Thirty-Five, making it as convenient as it gets. Café Lucia has authentic Portuguese food that we couldn’t get enough of. Do yourself a favor and be sure to order the mac and cheese. There is nothing that goes better than a day of wine tasting than a fun sandwich, am I right? We made a mid-day stop at this cute grocery/deli in downtown and fueled up for the rest of our afternoon. One of my biggest weakness in life is a BLTA, and this one did not disappoint. SHED is everything you want for a mid-morning break. Coffee bar, amazing brunch, and a little shop with everything my kitchen needs and more. It was a little crowded, so we sipped coffee outside before we got a table on the patio out back. I’m still thinking about those ricotta pancakes. Grab yourself an afternoon pick-me-up coffee at Flying Goat, located right off the square. You know Tyler was ALL over this one. Noble Folk is boutique, hip ice cream done right. This cute store sells artisan ice cream with unique flavors, pie (PIE), and coffee. This spot is less than 100 feet away from Oakville Grocery, by the way, for those who need something sweet at the end of every meal (me). Stop by Moustache Baked Goods for an amazing cupcake. Moustache is actually affiliated with Noble Folk, and both spots are great for a treat and an Instagram. Try the red velvet cupcake, and thank me later. We had the BEST time in Healdsburg and can’t wait to plan our next weekend trip to the area. Thanks for highlighting Healdsburg and mentioning much of the area is up and running post 2017 fires. One correction however, Healdsburg is in Sonoma County not Napa. Next trip check out what Windsor, CA has to offer. You might enjoy it.